Did you know that cheeseball may refer to two different products? No matter what comes to your mind, it's National Cheeseball Day, that falls annually on April 17. 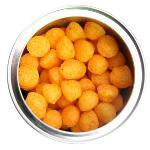 Crunchy and bright cheese puffs in the shape of balls will turn your fingers orange. This snack is similar to the cheese doodles. It is manufactured by extruding heated corn dough through a form of particular shape. You can serve cheeseballs on National Cheeseball Day to celebrate the holiday. The other version of cheeseball is what you make for parties as an appetizer. This is a soft cheese spread in a shape of ball, served with crackers. Traditional cheeseball appetizers can include different ingredients, like cheddar cheese, cream cheese, pepper, garlic, salt, nuts. Gourmet versions of cheesballs call for blue cheese, sherry, pineapple, olives and even smoked salmon. You can celebrate National Cheeseball Day in two different ways. Invite your friends over a snack party with puffed cheeseballs or serve your own gourmet cheeseball as a great dinner appetizer.